Come and serenade the season of monsoon with Katie Bagli, and our eternal love-affair with the season which brings with it the fruitfulness of spring and summers, and the fulfilment of autumn. Each year most of us look forward to the monsoon season. Not only because of the cool breeze that brings a welcome respite to the searing heat of summer (‘monsoon’ comes from the Arabic word ‘mausim’ meaning season of shifting winds), but also because the rains seem to wave a magic wand, making all of nature come alive. It is during this season that we get to see the various moods of the weather gods – loud booming thunder, flashes of lightning, tempestuous gales, gentle drizzles. Of course, the monsoons wreak a lot of havoc in our unplanned, unprepared cities, but take a break and go to the countryside and you get to see nature at its best. Seeds that had lain unnoticed on the forest floors suddenly germinate. Frogs and toads that had been strangely silent during the rest of the year become conspicuous by their nocturnal overtures which they render most passionately. Fluorescent green meadows with a vivid array of wildflowers, streams and waterfalls gushing down the mountains add to the great artist’s palette. The wild varieties of what we normally buy from the market emerge like phantoms in the forests – wild yam (Amorphophallus commutatus), wild grapes (Vitis vinifera), wild turmeric (Cucurma pseudomontana), wild ginger (Costus speciosus) – the list is pleasantly long. Moreover, we get to see a plethora of wild monsoon flora which only thrives as long as the rains last. Just to name a few, the fragile white Tutari flowers (Rhamphicarpa fistulosa) whose petals are translucent, the ghost flowers (Aeginatia indica) which are seen near streams and are actually root parasites and the strange Cup-and-Saucer plant (Breynia retusa) whose flowers dangle like tiny bells and fruits look like inverted cups resting on saucers, initially green, then turning to red. If we are lucky then towards the end of the season, we may get to see the ethereal Glory lily (Gloriosa superba) flowers that look like exquisite red and yellow chandeliers. The plant, which is a climber, is highly endangered because it’s over-collected by people. The excessive foliage at this time of the year is teaming with a host of insects, many of whom are ever-hungry leaf munchers and many are predators making meals of those other insects. Just walk along a grassy path and you get to see hundreds of grasshoppers leaping out in all directions. Let the rain clouds dispel for a while to reveal the hidden sun and outcome the fluttering flying jewels, the butterflies who are sun-worshippers and look like fairies of the forest. 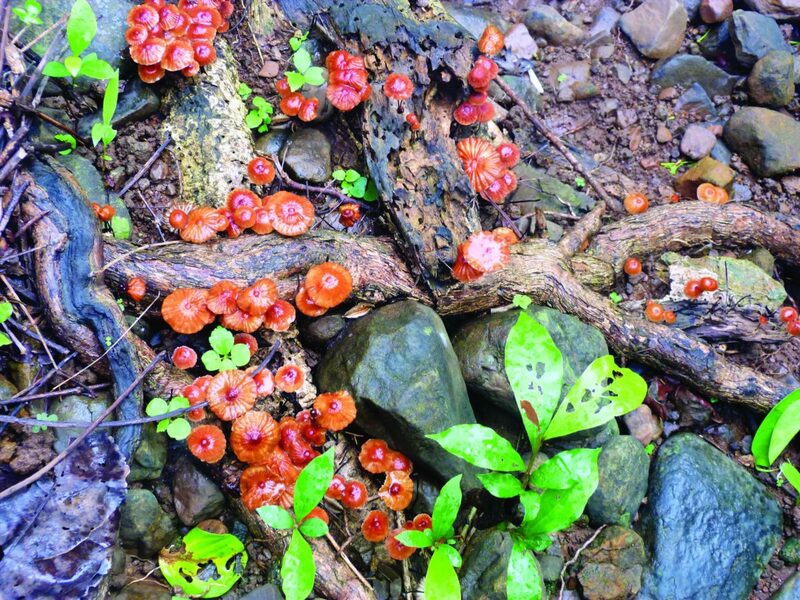 We also get to see a variety of fungi and mushrooms, the saprophytes that decompose all dead matter and release precious elements into the soil.